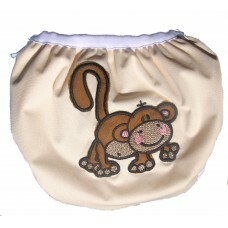 Gentle beige washable swim diaper with brown monkey applique. Shipping Note: We can ship swim diapers in a Canada Post Regular envelope for $3.00! For more information see the Specifications tab on this page. Bright green washable swim diaper with yellow duck applique.Shipping Note: We can ship swim dia.. Bright orange washable swim diaper with happy octopus applique.Shipping Note: We can ship swim ..
Blue washable swim diaper with spouting whale applique.Shipping Note: We can ship swim diapers ..